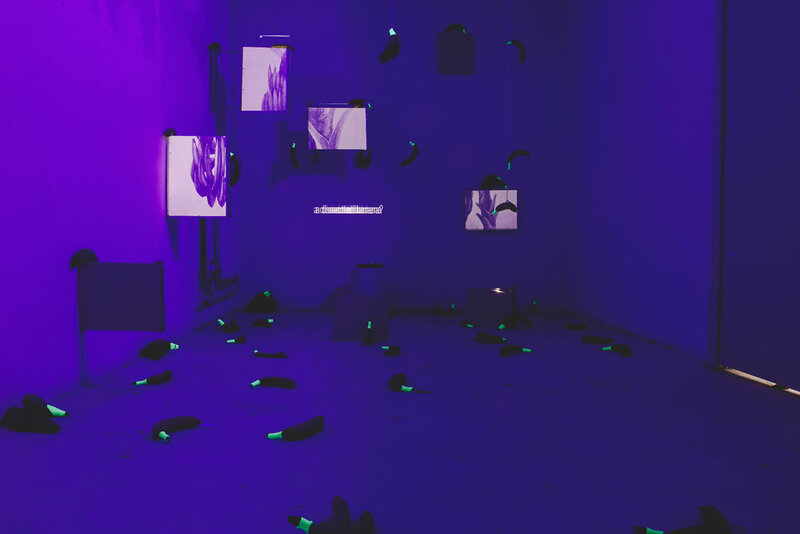 Kang Gao, is an individual who is constantly faltering, chasing the ever changing and shifting embodiment of subjectivity which is, always, encountering super-complex situations as if happening for the first time. His work, thus far, attempts to capture the romance inside this mega-complication of the contradiction between the permanent ‘not yet’ and the temporal forever-new with his decentralised and ephemeral aesthetics. In his latest works, dispersed moving light from the projection and the arbitrary arrangement of the installations made by post industrial material both played big roles in the whole set. But none of them can represent the work by itself. There, the lights, the sounds, the screens made by Dibond aluminum sheets, the screws, the dirty walls, the dust controlled by the gravity from all the potential existing dimensions, and all the affective existences inside of this space remaining unseen that is beyond the limitation of the dimension of time becomes the new continually alerting embodiment of the ever ‘not yet’ complete idea that he proposed. By all of thus he is conveying the emptiness of the pre-existed subjectivity and the specific temporality of our very today notion of human being that floating in between of reason and instinct, subjectivity and objectivity, machine and animal.